In the cultural life of the Kurds, split up as they were in ancient times by feudal barriers, today by State frontiers, music came to play the role of a privileged, let us say unique medium: it filled a precise and basic social function. From historical chronicles to lyric poetry and from epics to literary works, all are sung, everything is put to music in order to be better or more easily memorised and thus handed down to posterity. 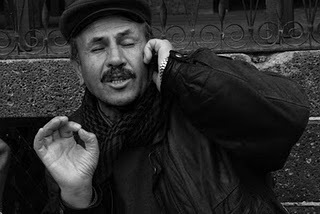 Kurdish music is, then, principally folk music and “anonymous”. The circumstances of its origins and development are, in fact, very diverse and difficult to establish with accuracy. originally purely vocal, a song was often composed by a woman wishing to express her feelings of sadness or, more rarely, of joy. It might also break forth in the course of the poetic contests the young men and women indulged in on their return along mountain paths or at other gatherings of young people: nocturnal meetings in the village square, New Year’s celebrations, marriage ceremonies which might last from three days to three weeks. or, then again, a song might be created from the blow of tragic events. once the song is created, an instrumental accompaniment is added and it achieves anonymity through the intermediary of the dengbêj (bards) who disseminate and popularise it in the course of their travels from village to village, from encampment to encampment. A dengbêj is a peasant endowed with an exceptional memory, possessing a voice of fine quality or possibly mastering a musical instrument. The dengbêj is not content merely to make known from one end of the Kurd territory to the other the local creations of others, thus acting as an effective agent in the development of a Kurdish national culture: he is also, himself, a creator, poet, composer. on the other hand, there are the mitrib (entertainers) or cengene, semi-professional musicians of “Bohemian” origin, specialised in playing the def (bass drum) and the zirne (oboe), who enliven the local festivals as well as wedding parties, and who are often simply performers on the instruments. Transmitted orally from generation to generation, the song, as a general rule, retains quite faithfully its original words. But the melody is only a very supple frame, subject to constant modifications and to continuous renewal a renewal which helps to perfect the music and provides a guarantee of its perennial quality. The interpreter is rarely a simple performer; he puts great effort into his task, showing the nature and richness of his adaptation, recreating each work in his repertoire, accompanying them with instruments which were not used in previous interpretations. The role of instruments is relatively secondary. As in the case of the other folk musics of the Near East, that of Kurdistan is monodic; the melody itself has a fundamentally vocal character; the instrumental accompaniment is intended above all to put the listener in a certain mood to make him more receptive to the vocal message. Furthermore, hearing the same song sung differently, with the accompaniment varying from one region of Kurdistan to another, one would be inclined to believe in the priority given to the words over the melody, the latter serving above all as an aid to the memorisation of the words. This is true, but only partially so. The nomadic way of life had a profound effect on cultural life and especially on music. The songs of the nomad shepherds, the melodies sung in olden times on the occasion of festivities marking the departure for the Zozan (high mountains) or the return to the plains, or in the course of celebrations over the birth of lambs or the shearing of the wool, all of these still have an important place today in the repertoire of Kurdish music. on the southern plains of Kurdistan, watered by the Tigris, the Euphrates and their tributaries, a civilisation of farmers developed. The demarcation between the mountain culture (of nomad origin) and the sedentary culture of the plains is rather clear in the field of music. While the music of the mountain people makes use particularly of wind instruments, some of which, such as the dûdûk, have a special capacity for creating echo effects, in the instruments of the plains stringed instruments predominate and especially the tenbûr, a six-stringed lute. However, whether from the plains or the mountains, the valleys or the plateaus, the Kurdish songs have a number of traits in common: the “long” songs, dramatic and nostalgic, with the exception of the dilok, dance tunes and music for entertainment, which are numerous and spirited. The traditional Kurdish song has a repetitive structure whose unity is provided by a strophe; this generally consists of from three to seven musical phrases. A strophe contains in itself the whole melodic line, and from one strophe to the next only the words change. The phrases do not necessarily have the same length since the lyric, which is free, only occasionally contains an identical number of syllables. Furthermore, if a song is “long”, it continues in the same mood from beginning to end: gay or animated passages of another mood or, stimulating rhythm do not enter the picture or intrude on the single ambience of the song. This structural scheme is the same for religious songs as well as for the dilok.